If you are an advertiser, and are willing to sponsor the stories on Facebook forum, better hurry up because Facebook will eliminate all the sponsored stories in April. According to blog posts Facebook will cease to show any of the sponsored stories by 9 April this year. On that day, all the sponsored stories will be converted to some other Ad formats. Sponsored stories are based on remarks or interpretation shared by some of your friends about famous products or companies. These events focus on sponsored pages like Nike. The brand owner may decide to sponsor the interaction to promote its marketing and advertisement. Such sponsored stories will show you in your newsfeed about as your friend’s interaction. The sponsored stories will have a slightly different social context beginning from April. All the posts that show your friends have liked the pages of products of the brand will simply show up as Facebook advertisements. The brands will not be able to sponsor the stories for their promotion. Instead, the users will be promoting the brands as a commonplace on Facebook. Simply put, all advertisements that include your friends will have common worth among other Ads not being able to be sponsored. Some reports from Facebook show that the social network will include “social contexts” as its major strategy for advertisement. “Social Contexts” are themselves types of sponsored stories that literally eliminate the need for having any kind of redundant standalone sponsored stories. As the name implies, social contexts have wide horizon of influence and will have much better impact than the sponsored stories. Facebook spokesman told during an interview that social contexts will eliminate any requirements for having sponsored stories. The social advertisement of Facebook gives credit to the users that people opt for. Nobody will be able to see any piece of information that they never came across in the past. 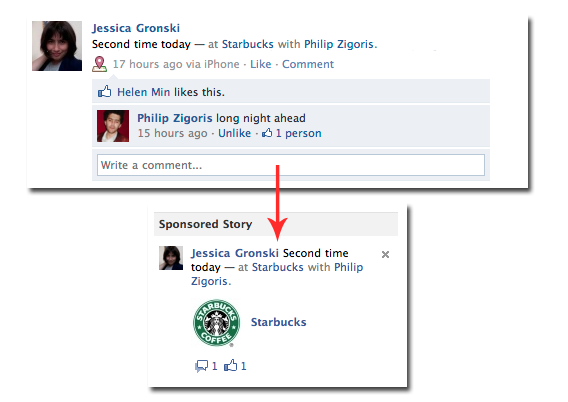 Sponsored stories have been quite useful for the companies that showed their advertisements on Facebook. Social media forum is the best forum for advertisement where you can find many people who like your brands or products. The brands are promoted automatically with every punch of “Like” on Facebook. Now, “Social Contexts” will transform all such sponsored stories into common Facebook advertisements. As a result, the advertisement will not be flooded to all users as in the case of sponsored stories. The advertisements will be customized for a specific audience marked by users.